Today was a momentous day for me. For the first time, a woman actually took me to lunch. Sure, it was my boss. And sure, she was only doing it because she was so happy to be getting rid of me. But still, I must say, it felt nice. We decided on a little place in Westlake that I’d always wanted to try, but had never seemed to make room for. It’s called Galletto and its specialty is Brazilian food. Which is a lot of meat. Think BBQ meets Italian with some Latin flavor thrown in. We arrived around 11:30am for an early lunch. They were just opening and there were only a couple other tables that were occupied. It was a nice day so we decided to sit out on the patio. The first thing I noticed was that the chairs were very awkward. Instead of allowing you to sit back, the high backed chairs forced you forward toward the table. This was fine once the food arrived, but it deprived me of one of my favorite things while dining out: sitting back and enjoying a little conversation. While looking over the menu, I asked my boss what she had eaten here previously. She let me know that the Brazilian chicken was excellent and that ended up being the dish she ordered. I kept flipping through the menu and was stopped by the sandwich section. They have a sandwich called the Braziribs sandwich, which they claim was voted one of the Top 5 sandwiches in L.A. by Los Angeles Magazine. Talk about a “you had me at hello” moment. From then on it was all I could think about. Unfortunately, about 10 minutes after ordering it, our waitress came back to inform me that they were all out of the famous Braziribs. Now I don’t know what the sandwich is, exactly, but I do know that if it was voted in the top 5 best sandwiches in all of L.A., you should probably have it available. Especially considering the fact that it was just after opening. Needless to say, I was heartbroken and inconsolable. The waitress brought the menu back out for me to make another selection, but at that point it seemed as though nothing else would fill that hole in my heart. 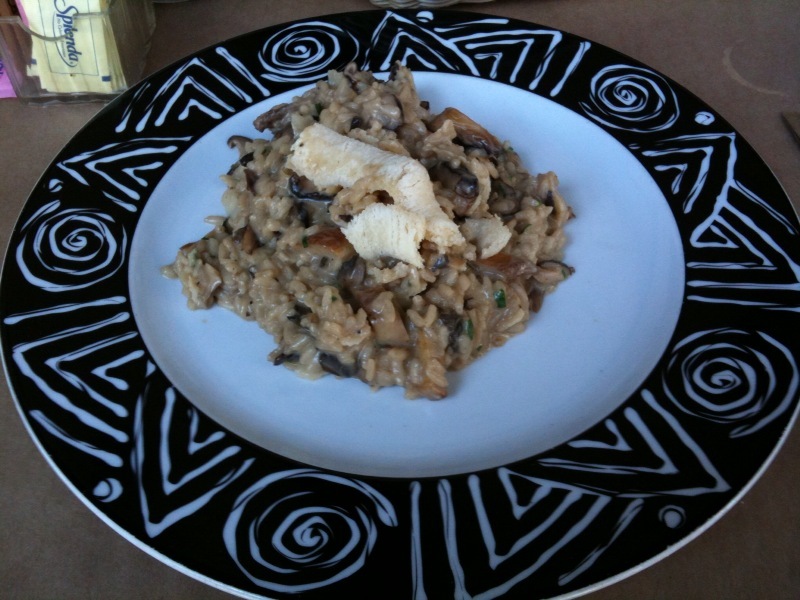 Eventually, and at the suggestion of my boss, I ordered the mushroom risotto to ease the pain. I also began to shovel tapenade-loaded bread into my mouth like a kid who found a Hershey bar at fat camp. For the record, the tapenade was pretty good. I was just too distraught to fully enjoy it. A few minutes later, our meals made their way out to the table. Cherry’s chicken looked great and there was a lot of food on the plate. 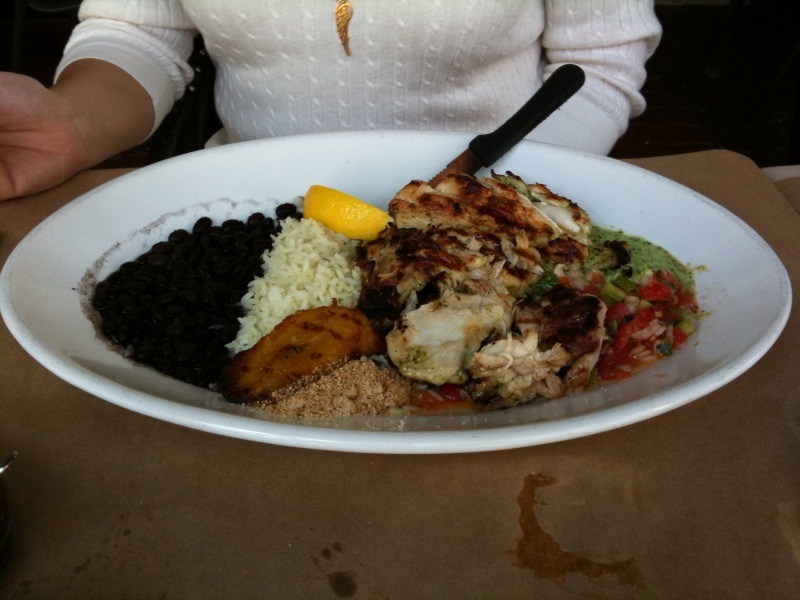 The meal comes with black beans, rice, fried plantains and chimichurri sauce for the chicken. Cherry was also generous enough to let me try a piece of the chicken, which was moist on the inside, but crispy on the outside. The chimichurri was not overwhelmingly powerful and complimented the chicken nicely. My risotto came out with a little more fanfare. You see, when you order it, they roll out this cart with a huge wheel of Parmesan. What you don’t realize is that your risotto is inside the wheel. They grab a couple of those scrapers like you see at Coldstone’s and they go to work shaving Parmesan into the risotto. The fresh Parmesan really adds another dimension to the dish. Although, isn’t fresh Parmesan an oxymoron? I mean, it’s cheese so I guess by definition it’s not fresh, but you get what I mean. It takes away some of the creaminess of the dish and replaces it with a more hearty, somewhat overwhelming, yet not at all unpleasant flavor. It was one of the better risottos that I’ve had because it wasn’t too thick and it did a great job of balancing the savory mushroom and Parmesan with the sweetness of the dairy. It held together nicely without being too heavy, which I find to be an all too common occurrence in risottos. 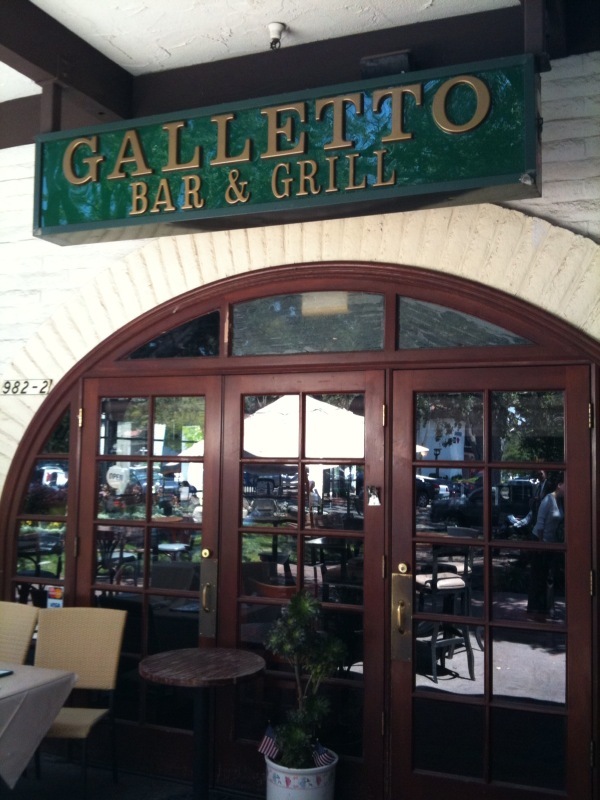 Overall, the quality of the meal was excellent and I was glad that we had chosen Galletto for our last supper. Am I still a little pissed that I didn’t get my world-beating Braziribs sandwich? You bet I am. But what’s done is done and there’s nothing I can do to change it. But since I probably won’t get the chance to go back to Galletto, I think one of you guys should do it for me. Get the Braziribs sandwich so you can, first of all, tell me what it is, and second, tell me if it’s any good. In the meantime, I hope you all have enjoyed reveling in my shattered dreams. Tomorrow, Mikey will be back to one-up me with his two syllable words and folksy charm. I, for one, can’t wait.